Wabsworth was puzzled. Some time after he was copied from the Wabbit he had added a puzzlement algorithm which communicated directly with the Department. He'd never used it, not until now. He could hear vague cries of "What day is it?" from Skratch and Jenny. Then he heard shouting about anti-realism that he couldn't quite make out. He knew the rabbit with the axe quite well. It was Major Spitlove the double agent. Above him, the dome was barely discernible but it was coming down fast. 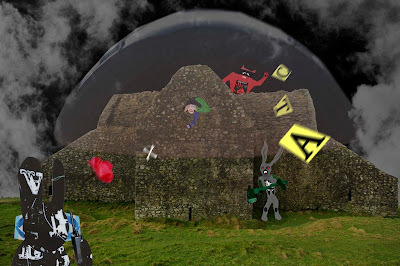 Wabsworth recalled that the Wabbit liked a trick at Hallowe'en. He mulled it over super fast. "It's too baroque." he murmured. Suddenly letters span from the dome. Then a rose and a crossbones badge loomed fast towards him. "A time vortex," he breathed. He spoke into his radio but it was dead. He shook it and whacked it against a paw. Nothing. "It usually works for the Wabbit," he sulked. Spitlove was the closest. "Major! What's going on?" Major Spitlove shifted his stance, waved the axe up and down and mouthed something. It was a simple matter for Wabsworth to read his lips and he spoke the words out loud. "Bad air." Spitlove nodded his head and vanished into the building. "I'm an android, it won't affect me," thought Wabsworth. But his legs started to twitch and he wanted to dance. He jumped on his radio and it skirled with the sound of the pipes. "Hooch" yelled Wabsworth - and he hopped under the dome ..